Damaged drywall or sheetrock can have a definite negative effect on the appearance of your home. Taking steps to repair these structural components is essential before painting or papering your walls. In most cases, working with a company that specializes in house painting and home renovations can provide you with the right support for your project while ensuring the most professional results. Here are some of the most important considerations when planning your home remodeling or repainting project. Sheetrock repair may be necessary for a variety of reasons. Normal wear and tear can cause dents and deterioration of these key elements of your home. Accidents caused by children and pets can also result in damage to your sheetrock and drywall. Some cracks could be the result of excessive humidity or settling of your foundation. Whatever the reasons, repairing these problems quickly can help you to protect the integrity of your walls and ceiling while ensuring the most attractive appearance for your home. For smaller areas of damage, your local handyman can often apply a surface treatment that will restore the smooth surface and visual appeal of your walls and ceiling. If you have more extensive damage to your drywall, however, replacement may be the best option for your situation. Removing and replacing water-damaged sheetrock and drywall can prevent mold and mildew from developing in these wall surfaces. Working with an experienced professional can help you determine the most cost-effective and practical solution for your drywall and sheetrock repair needs. At Griffith Handyman, we offer professional sheetrock repair and replacement services designed to suit your needs and your budget. 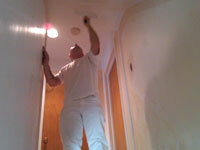 We also offer all types of home renovation and restoration services for our customers in New Jersey. If you are looking for an affordable solution for home painting, sheetrock repair or any other home renovation project, we can help with courteous and prompt service for you and your family. Call us today at 973-831-6102 to discuss your project with us. We look forward to the opportunity to serve you. Keeping your home in good repair can help you maintain your property values and can enhance your enjoyment of your New Jersey residence. 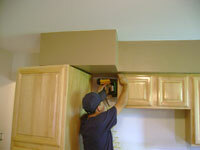 Finding the right handyman repair and remodeling service is a critical part of this process. At Griffith Construction Inc., we specialize in delivering the most cost-effective and practical solutions for all our clients. We work with you to identify the root cause of your issues and to repair them quickly and to your complete satisfaction. Here are some key factors to consider when choosing a repair and renovation company for your New Jersey home or business. References and reviews are important indicators of quality craftsmanship in the handyman, remodeling and home repair field. Griffith Construction can provide you with the names and numbers of some of our previous clients to allow you to check out our previous work for yourself. This can provide you with an accurate assessment of the quality of our work and the satisfaction of our customers to make a more informed choice regarding the services we provide. Choosing a handyman with experience in a wide range of repair and renovation fields can help you enjoy true one-stop shopping for all your ongoing maintenance requirements. In some cases, the underlying issue may not be obvious based on the symptoms you report. Griffith Construction can perform in-depth inspections that can identify the real problem quickly and restore your doors, windows and other systems to proper working order. We can remodel and renovate bathrooms, kitchens, decks and patios and can provide expert remediation services after a flood or other water damage event. Our extensive lineup of services allows you to enjoy the greatest range of options when working with the team at Griffith Construction. We know your time is valuable. At Griffith Construction, we work hard to stay on schedule and to complete your repair or renovation project as quickly and efficiently as possible. Our team of talented technicians will work with you at every stage of the project to make sure you are aware and informed of the steps we are taking on your behalf. This can help you plan more effectively for your upcoming remodeling project or repairs while ensuring that you are completely satisfied with the services we provide for you. To learn more about our extensive lineup of services or to schedule a small or big job with us, call Griffith Construction today at 973-831-6102 or at 201-493-9999. We look forward to the chance to provide you with the expert services you need to get the most from your New Jersey home or business. Cleaning your gutters can be a challenging proposition. In most cases, leaving these tasks to a professional NJ gutter cleaning company can save you time and effort while reducing the risks associated with the process. Companies that specialize in gutter cleaning and home maintenance services can usually get these jobs done faster and with less stress, allowing you to enjoy the benefits of a well-maintained home without all the work. Here are some important reasons to leave your gutter cleaning to the experts. If you are like most homeowners, you have had limited opportunities to learn the ins and outs of gutter cleaning. As a result, you could easily miss early warning signs of trouble that could lead to expensive repair bills for you and your family. You might also unwittingly do some damage of your own to your gutters during the cleaning process. By hiring a professional NJ gutter cleaning company to manage these tasks on your behalf, you can be sure that any developing issues are spotted quickly and addressed in a timely fashion. Gutter cleaning requires you to work at a significant height from the ground. This usually entails the use of ladders and may require you to enlist the help of a friend or family member to steady these structures. This can involve a good deal of planning to pull off successfully. By working with a company that specializes in gutter cleaning in New Jersey, you can avoid the risk of falls that could result in serious injuries for yourself or someone else. This can potentially save you money on these routine tasks. Your professional gutter cleaning team will take care of all the cleanup and disposal chores for you. This can allow you to enjoy the benefits of clean gutters without all the stress, worry and clean-up time needed to complete these tasks on your own. By working with an experienced contractor, you can enjoy the benefits of proven expertise while avoiding the annoyance of clean-up after the job is done. At Griffith Construction, we are proud to offer the gutter cleaning New Jersey homeowners count on to keep their homes in top condition. We also offer remodeling and handyman services that can help you manage routine maintenance for your home and can take some of the stress out of your everyday routine. Call us today at 973-831-6102 to discuss your gutter cleaning project or to schedule other services with us. We look forward to the opportunity to serve you. If you are planning a new deck installation or considering repairs to your existing deck, making sure that your plans are in accordance with local codes can help you avoid a fair amount of hassle during this process. Working with an experienced contractor can help you avoid any difficulties with city and county officials and can ensure the best possible solutions for all your deck needs. Here are some of the hottest trends and the most important maintenance tips for your New Jersey deck. Bringing the indoors outside with covered deck areas, innovative lighting options and audio and video entertainment centers can increase the appeal of your deck throughout the spring, summer and fall. For tech-savvy families, installing a Wi-Fi extender to provide connectivity in your back yard and deck can be a valuable investment in family togetherness in the outdoor setting. We can also design and install a new deck to your precise specifications, allowing you to enjoy the best of outdoor living right at home. To learn more about how we can help you enjoy the most modern and appealing deck possible, give us a call at 973-831-6102. We look forward to the chance to work with you. You and your family depend on your stairs to navigate your home safely. Making sure your stairs are up-to-date and in good repair can help you maintain the value of your New Jersey home and can ensure the most beautiful and practical staircases throughout your residence. The handyman experts at Griffith Construction, Inc. can provide you with professional guidance and support in creating the safest and most attractive interior designs possible. Here are some key indications that it may be time to update and upgrade your stairs for a fresh new look. If your current railings, posts and balusters are showing signs of advancing age or wear and tear, our carpentry professionals can replace these components of your stairs to create a brand-new look and a safer environment for you and your family. We will work with you to determine the most appropriate style choices to suit your décor and your budget perfectly. Loud noises and creaks when you or your family members travel up and down your stairs could be signs of deterioration in the underlying structural elements. Scheduling an inspection with Griffith Construction, Inc. can provide you with added information about the condition of your stairs and the best ways to approach any needed repairs. In most cases, carpeting on your stairs is an indication of dated décor. Removing this carpet and replacing it with hardwood inlays or caps can create a more modern look and a better experience for you and your family. Our team of flooring experts will discuss the best options for updating your stairs and enhancing the appearance of your home. At Griffith Construction, Inc., we are committed to providing the best array of handyman services for our customers. We can deliver the most cost-effective solutions for all your stair repair and updating needs. Give us a call today at 201-493-9999 to learn more about how we can help you enjoy your New Jersey home to the fullest degree. 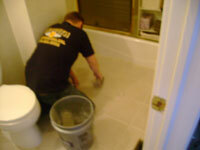 Carpet, Tile & Upholstery Cleaning, Handyman Services or Full Scale Remodel, Griffith Construction does it all! Repairs and maintenance in our homes and businesses never seem to end and neither do Jim Griffith’s skills from carpet, tile & upholstery cleaning to handyman to water cleanup and flood restoration to full scale construction projects, his company can do it all. In addition to being your local handyman, Griffith Construction, Inc. and Griffith Carpet Cleaning offer 24/7 emergency water cleanup and flood restoration services to residential and commercial customers in Northern New Jersey. Whether it’s a leaky skylight or a tide of flood water, water damage in your home or business is a nightmare scenario. The water, the smell, and the potential for problems make water leaks an emergency – whether it’s the middle of the day or the middle of the night. The staff is fully trained in the most efficient methods by The Institute of Inspection, Cleaning and Restoration Certification (IICRC) for the latest in carpet, tile & upholstery cleaning and water restoration methods. They have the equipment, including truck-mounted extraction units and the experience necessary to handle the most challenging situations. They apply deodorizer to control odors and disinfectant to help stop the growth of harmful microorganisms. Their drying equipment helps to prevent the swelling and warping of floors and walls, as well. “Removing wet carpet is no easy task–there is a great deal of skill that comes with doing it properly and preserving your property.” said Griffith. Griffith began working in construction at the age of 14. In 1999, he started his own business of carpentry repair and then moved on to painting and up to full scale remodeling. In 2008, when the recession hit, he realized his customers needed more handyman skills than remodeling work, so he quickly utilized his staff to meet those needs. “We bring more skilled labor at reduced rates,” said Griffith. That skilled labor comes with the proper licenses and certifications from the state of NJ and the federal Environmental Protection Agency, including a lead safe certification. Griffith Construction, Inc. is an owner-operated handyman service company that does not have to pay a franchise fee, and this allows them to keep their handyman rates competitive and cost efficient for home and business owners. They specialize in a wide range of services, including carpentry repair, concrete/masonry repair, painting, sheetrock repair, tile repair, tile re-grouting, deck repair, door/lock repair and replacement, re-caulking of doors-window-tubs, power washing, gutter cleaning, carpet cleaning and many other handyman and remodeling services in New Jersey. Griffith said he is personally involved in each job and once he starts a job, he says his crew will stay until it’s complete. With the rainy season upon us, this is key in helping property owners clear out flood damage and get back to normal as quickly as possible. When choosing a carpet, tile & upholstery cleaner, a handyman, flood restoration expert, or a contractor, Griffith suggests you be sure your choice is licensed, insured, reputable and has their own equipment. Less expensive bids are often cheaper because the company does not carry the proper insurance. Posted in bathroom remodeling, Blog, concrete repair, deck repair, handyman, kitchen remodeling, painting, tile repair	| Tagged bathroom remodeling nj, concrete repair nj, deck repair, deck repair nj, handyman, handyman nj, kitchen remodeling nj, painting contractor nj, painting nj, tile repair, tile repair nj	| Comments Off on Carpet, Tile & Upholstery Cleaning, Handyman Services or Full Scale Remodel, Griffith Construction does it all! Time to start thinking of winterizing your house and keeping warm! Now that the winter of 2011 is here it is time to start thinking of winterizing your house and keeping warm. At Griffith Handyman we offer many forms of weatherizarion services from caulking drafty windows, to installing new seals and weather stripping on doors to insullating basements and attics. Give us a call and let us come out and give you an estimate to help you keep you home or business warmer in this winter season of 2011. Posted in Blog	| Comments Off on Time to start thinking of winterizing your house and keeping warm!